After a year of setbacks, and the tragic death of the senior investigating garda, the trial of Regency Hotel gun murder accused Patrick Hutch finally collapsed. A nolle prosequi was entered at the Special Criminal Court yesterday, bringing to an end the high-profile gangland trial that had been beset by delays. Simmering anger boiled over in court as outraged relatives of David Byrne, the man who was shot dead in the 2016 Regency raid, shouted that the collapse of the trial was a "disgrace" and gardaí were "afraid of the Hutches". Patrick Hutch was freed and left the building within minutes, departing on a motorbike. The case had already been halted at the non-jury, three-judge court for an inquiry to be carried out into the circumstances surrounding the death of Detective Superintendent Colm Fox, with repeated adjournments since then. Mr Hutch (25), of Champions Avenue in north inner city Dublin, had pleaded not guilty to the murder of David Byrne (34) at the Regency Hotel in Dublin on February 5, 2016. He also denied possessing three AK47 assault rifles, a charge that has also been withdrawn. The shooting happened during a boxing weigh-in, when the hotel was stormed by a man dressed as a woman and another wearing a flat cap, armed with handguns, followed by a "tactical team" of three men disguised as gardaí with assault rifles. It was the prosecution's case that Mr Hutch was the man dressed as a woman - and that he did not shoot Mr Byrne, but was part of a "shared intention" to commit the offence. 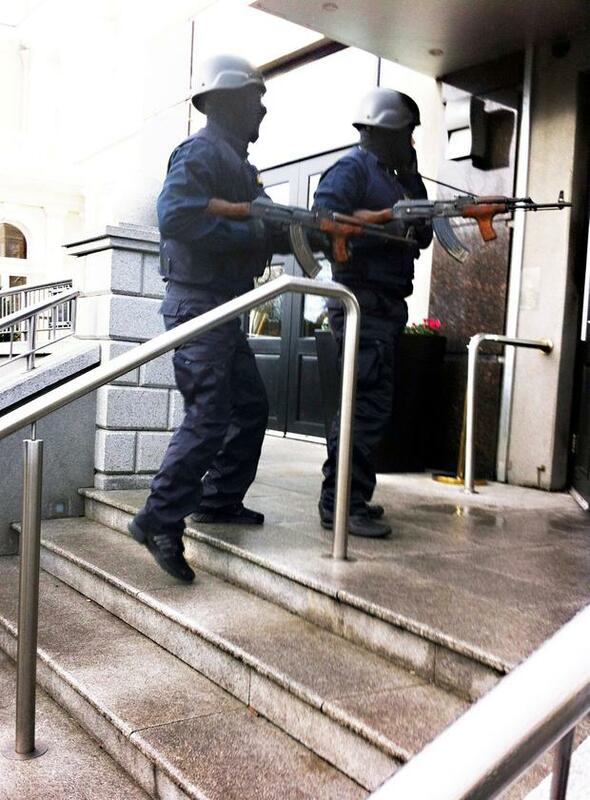 There was heightened security throughout the Criminal Courts of Justice yesterday, with Garda public order and armed response officers patrolling the building. Up to 10 gardaí were on duty in the Special Criminal Court itself before the case got underway. Members of Mr Byrne's family, including his parents James and Sadie Byrne, sat in the court's public gallery waiting for proceedings to start. Dressed in a grey suit and open-necked pink shirt, Mr Hutch was brought into court as the case was called. Prosecuting barrister Sean Gillane SC outlined the last year's proceedings to the three judges. "Sadly, the passing of Det Supt Fox, the senior investigating officer in the case, has resulted in a situation where the prosecution is not in a position to lead evidence on a number of evidential topics," he said. "My application is to have a nolle prosequi entered," he added. "I am not resisting the application and have very little to add other than to say that my client had pleaded not guilty, the case was very keenly contested and if it had gone to trial the same course would have been pursued," Mr Hutch's barrister Michael O'Higgins SC told the court. "In light of the application not being opposed, further comment is not necessary and I will discharge Mr Hutch from the indictment," presiding judge Mr Justice Tony Hunt said. Mr Byrne's mother Sadie Byrne then addressed the court, asking: "Can I say something, please?" Judge Hunt said he understood it was "very upsetting" for her, but she continued to ask to speak and the three judges rose. Another member of Mr Byrne's family then began shouting: "It's a disgrace, it's a disgrace, it's an absolute farce, this trial. Where is the justice?" She said the gardaí could not solve this case, but could solve others. "Yous are afraid of the Hutches, that is what you are," another woman said. Mr Hutch, who sat in the dock, watched the brief proceedings without reacting before being led away. No detailed reason was given in court for the DPP's decision. The trial had heard just four days of evidence last year, but the witness testimony was often dramatic and shocking. The six raiders had arrived in a silver Ford Transit van after 2pm. As well as the "tactical team" and the men in the wig and flat cap, there was an unseen getaway driver. The targeted event was a boxing event weigh-in. Daniel Kinahan was spotted there by one eyewitness before the attack. The men in the wig and flat cap walked into the hotel first, opening fire with handguns in the Regency Suite, which was packed with boxers, managers, trainers and families. David Byrne was among those running in panic into the reception as the tactical team dubbed "Tac 1, 2 and 3" walked in. Tac 1 first shot and injured Sean McGovern inside the doorway, then turned and shot a fleeing David Byrne. He fell wounded to the ground and Tac 2 shot him again, then jumped onto the counter before turning back to Mr Byrne. "He calmly and coldly discharged the weapon again, discharging further rounds into the head and body of Mr Byrne," Mr Gillane said. Meanwhile in the suite, someone said, "It's OK, it's OK, the ERU are here", before the tactical team walked calmly into the centre of the room. One of the two opened fire, shooting and injuring Aaron Bolger. The man in the wig was heard saying: "I can't see him, he's not f***ing here." They made their escape and the van was later found burned out. The prosecution's case centred on the purported identification by gardaí of Mr Hutch as the man in the wig in a press photograph taken at the scene. This was contested by the defence over five days of legal argument, but the evidence was ultimately ruled admissible. Before the trial could resume, the defence sought copies of emails between gardaí involved in the identification of the photo. Days later, Det Supt Fox was found dead and the case was further adjourned. Nobody else has been tried for Mr Byrne's killing.